A senior al Shabaab figure has openly disagreed with the Somali militant group’s leader, in a sign of growing internal divisions that residents fear could lead to violence. The al Qaeda-aligned group wants to remove the Transitional Federal Government (TFG) of President Sheikh Sharif Ahmed to impose a strict version of Sharia or Islamic law. They control large areas of south and central Somalia. Sheikh Muktar Abu Zubeir, who has led al Shabaab since 2008, said in a statement last week that no other armed or unarmed Islamist group could be created in the country. But another senior figure told a local radio station that Muslims could carry out Jihad in as many groups as they pleased. « No one can limit Jihad to himself. It is better to have many Islamic groups and then unite later. This is how we have been carrying out for the last two decades, » Sheikh Hassan Dahir Aweys, who merged his Hizbul rebel group with al Shabaab in 2010, told Radio Shabelle late on Saturday. Al Shabaab officials declined to respond to the comments by Aweys. Under intense pressure from African Union (AMISOM) and Somali government troops, the group has been hit by sharp internal differences over ideology and strategy. An influential American fighter known as Omar Hamami or Abu Mansour al-Amriki said last month his life was in danger due to disagreements with fellow fighters over Islamic law and strategy. Aweys’ comments followed a string of losses for al Shabaab to AMISOM and the TFG. 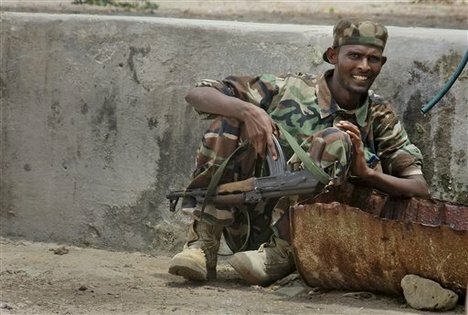 In recent weeks, they have lost key towns, bases and even regional capitals in central Somalia. Last Friday, both sides engaged in pitched battles as AMISOM tried to dislodge the Islamists from Mogadishu’s Daynile district, the rebels’ last position after they withdrew from the capital last year. Al Shabaab managed to repel the attack in some positions like the airstrip at Daynile, although they lost some ground. AMISOM is keen to take Daynile so it can launch an offensive against the nearby towns like Elashe, Lafole and Afgoi, where many senior al Shabaab leaders live. Residents fled from those towns on Sunday morning, fearing that AMISOM might strike soon, or the row between al Shabaab’s leaders could turn violent.